If you went to Art Basel in Miami you might have run into this odd pair of performance artists who call themselves Eva and Adele. They claim to be hermaphrodite twins from the future who landed their time machine in Berlin in 1989. (No one seems to know their real names or ages.) Eva, the taller one, was born a man and had her birth certificate changed to female. 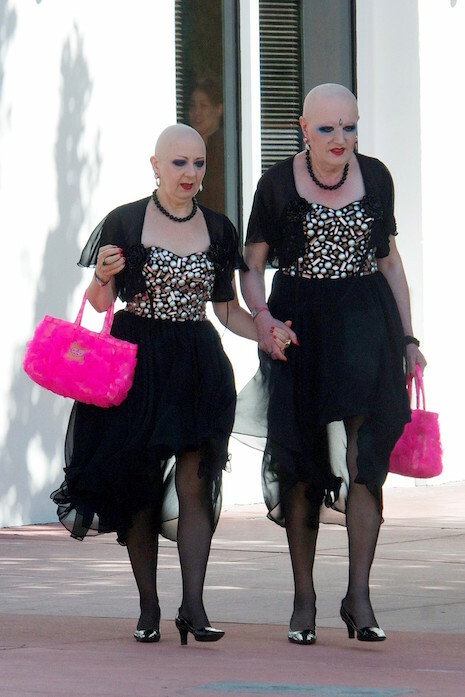 They dress alike (and extravagantly) every day with similar makeup and shaved heads. It’s not easy maintaining their image – it takes them 3 hours to get ready every day and they are never seen unless dressed to the nines. They try to attend as many art events as possible and sell their own creations. The one on the right is definitely Janet Reno. She faked her death. I saw them when I was visiting a museum in NYC 12 years ago. They were also visiting but it’s obvious that they just wanted people to look at them. They were ahead of their time: now everyone wants to be the center of attention.